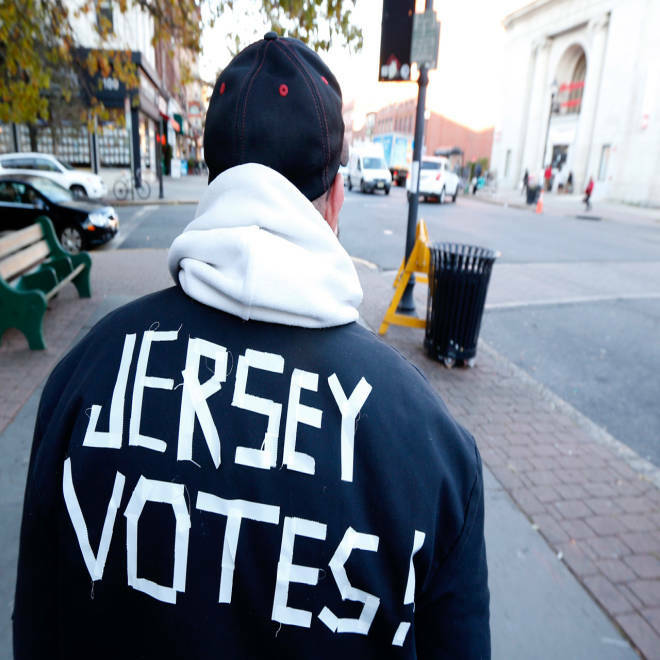 Ed Lippman, 58, wears a message on his jacket on Election Day while walking home, Tuesday, Nov. 6, in Hoboken, N.J.
New Jersey's emergency experiment with email voting hasn't fared well. One election official described it as a "catastrophe" and voters are complaining that computer glitches are blocking their last-minute efforts to obtain electronic ballots. An avalanche of requests for email ballots that overwhelmed county clerks' offices forced the state to extend its email voting deadline to Friday afternoon at 8 p.m., though email ballot requests had to filed by 5 p.m. ET Tuesday. "It has become apparent that County Clerks are receiving applications at a rate that outpaces their capacity to process them without an extension," said Lt. Gov. Kim Guadango in her order extending the deadline. Several election officials say misunderstanding is at the root of the problem: Email ballots are only permitted for residents displaced by Superstorm Sandy, but many who are not displaced are nevertheless deluging the system. "The numbers are overwhelming. The county clerks are inundated with requests," said Michael Harper, clerk of the Board of Elections for Hudson County, N.J. which includes Hoboken, one of the hardest-hit regions recovering from Sandy. Asked to describe the situation, he said, "I would lean more towards catastrophe." New Jersey has taken the extraordinary step of allowing votes to be cast all the way up until Friday. This applies to voters in counties affected by Hurricane Sandy, and could make the state vulnerable to lawsuits. NBC's Pete Williams reports. New Jersey's email voting law allows overseas residents and active duty military to request ballots electronically; it was extended by state executive order on Saturday to apply to residents displaced by the storm. NBC News Justice Department correspondent Pete Williams said the extreme step of extending the voting deadline could expose New Jersey to lawsuits. "This raises some interesting legal questions," Williams wrote. "A federal law requires all states to choose their presidential electors the same day. But another law says if a state fails to do that, then its legislature determines how its presidential elections are determined. Some legal experts say they believe while New Jersey may be in technical violations of federal laws if it does this, it's Congress that makes the ultimate decision about whether to accept a state's electoral votes. And they doubt that Congress would fail to count the votes of a state brought to its knees by the storm. " Another hitch is this: Residents must email or fax their requests to their county clerk's office, which must respond individually to each request. The mountain of last-minute requests is crushing clerks' capacity to respond. Janet Larwa, the deputy clerk at the Hudson County Clerk's office, told NBC News there were eight workers trying to process 3,000 email requests as of mid-day Tuesday. Frustrations weren't limited to Hudson County. In Essex County, which includes the state's largest city, Newark, the American Civil Liberties Union filed a lawsuit after it received 25 complaints from residents who said they'd requested email ballots, but hadn't received them. Voters reported that emails sent to the county clerk's office were bouncing, indicating the clerk's inbox was full or not functioning. "You've got people who are trying to utilize this email or fax voting capabilities the state has said they are entitled to," Alexander Shalom, policy counsel for the ACLU, told NJ.com. "The counties are so overwhelmed with these requests, they are not able to reply. People have emailed in requests to get ballots and they are not hearing back." The ACLU sought a court order that would have allowed displaced residents to fill out a Federal Write-In Absentee Ballot, typically used by overseas voters who apply for but don't receive their blank absentee ballots in time, but an Essex County judge rejected the petition on Tuesday night. Essex County Clerk Christopher Durkin tried to ease the problem by giving out his personal email Hotmail address to voters, inviting them to send ballot requests there, according to a message posted on the official Facebook page for West Orange, N.J., a city in Essex County. In Morris County, BuzzFeed.com reported that emails sent to that county's clerk were bouncing. The Daily Record reported the clerk there was struggling under a mountain of 1,000 requests. Harper, from Hudson County, said the problems stem from the wider email voting process being "thrown upon us at the last minute," not to mention the unprecedented volume. Larwa said that voters who aren't displaced from their homes are being turned down. Her office is calling some voters and denying their email ballot requests, telling them to go to their usual polling place. With power restored to much of Hudson County within the past 48 hours, very few polling locations have been relocated, she said. The problems might not stop with delivering email ballots, however. Experts are also worried that even if all New Jersey voters who need them receive email ballots in time, there will be confusion about submitting the ballots. The state's email voting procedure is a three-step process which is new to nearly all voters, and ripe for confusion, according to J. Alex Halderman, an electronic voting expert at the University of Michigan. Voters must request a ballot electronically; email or fax the completed ballot to the clerk; then mail the original hard copy to the clerk. "I'm not sure that voters will understand they still have to mail the ballot," Halderman said. "They may not be aware for requirement, even though it's on the form. If people don't do that, it will be fodder for lawsuits." Halderman is also concerned that computer hackers can intercept email ballots and alter votes, or otherwise electronically tamper with the process. "Email voting is tremendously risky ... you never want to make last minute change to an election process. That's a recipe for chaos," he said. "It's a reflection of desperation and seriousness of the situation New Jersey (post-Sandy) that officials are using email voting." Voting officials in New York apparently agree with Halderman. New York State Board of Elections co-chair Doug Kellner said during the weekend that his state rejected emergency email ballots because, "they're hackable and they're not verifiable," according to USA Today. Still, Halderman is worried that voters who get a taste of email voting may clamor for it in future elections. "We are definitely concerned that voters will want to have access to this again if they it convenient," he said. "But transmitting votes by email doesn't have good secrecy or integrity protection. It's easy to spoof an email, intercept an email, find it in someone's outbox and alter it ... It's possible to hack email servers and change votes after they are received. It's the highest level of risk for any kind of electronic voting." With reporting by NBC News Talesha Reynolds. Follow Bob Sullivan on Twitter; He writes for NBC News at the Red Tape Chronicles.